The greatest power of a media company is its ability to create and share valuable stories. Through more than 60 trusted brands and a strong journalistic focus, TMG knows how to reach Dutch consumers like no other. In words, images and videos, via all possible channels − and always with the consumer at the heart. What are consumers looking for? This is the question that guides us. In the growing stream of information, we aim to interpret and connect, through our strong brands, our strong positions in content domains and the rich data of the millions of consumers we reach every day. This makes us an attractive partner for advertisers, marketers, content makers and distributors. Together with them, we create value throughout the chain, in a socially responsible way. In 2016, TMG’s revenue amounted to € 421.0 million and the company employed an average of 1,790 FTEs. TMG's head offices are located in Amsterdam. TMG connects millions of people, with strong brands such as De Telegraaf, DFT, Telesport, Metro, Autovisie, Privé and VROUW; regional dailies such as Noordhollands Dagblad and De Gooi- and Eemlander; digital brands such as GeenStijl, Dumpert and Gaspedaal; Classic FM and – through a strategic partnership – national radio stations Sky Radio, Radio Veronica, Radio 538 and Radio 10. In addition, we have dozens of other brands and titles that focus on the provision of local news, entertainment and e-commerce, such as GroupDeal. Through Keesing Media Group, we are market leader in Europe in puzzle magazines and digital puzzles. The 24/7 strategy formed the guideline for all our activities in 2016. The main highlights, categorised by the six pillars of our strategy, are described below. Noordhollands Dagblad achieved a total brand reach of 999,000 in print and digital1. children's puzzle booklets published by Keesing Media Group in collaboration with Viacom, and new editions in countries other than the Netherlands: a total of around 200 new titles in 11 countries. Keesing Media Group introduced new mobile apps, including Sudoku, Tectonic and word search and crossword puzzles, which enable puzzlers to solve puzzles on their mobile phones as well as on their tablets. substantial gains of Keesing Media Group in its core markets France, the Netherlands, Belgium and Denmark. the partnership between Holland Media Combinatie and game platform XGN. the business units undertook various CSR initiatives, with a focus on knowledge sharing, development and charities. The 2016 and 2015 annual accounts have been prepared in accordance with the IFRS-EU guidelines applicable in 2016. The significant accounting policies are included in the consolidated financial statements. The consolidated statement of profit and loss is presented on the basis of continued operations. In the entertainment and media market, digitalisation and the transition from textual to visual content are unstoppable. This is the dynamic world in which TMG operates. The media industry has been experiencing strong consolidation: due to the fast growth of digital media and changing media consumption and consumer behaviour, media companies started looking into opportunities for upscaling, synergies and cost savings in order to successfully leverage the drastic changes in the market. On the 2016 playing field, publishers, media companies, TV companies, telecom and internet providers are all vying for the attention and budgets of consumers and advertisers. The Netherlands is one of the countries with the highest broadband and mobile data network coverage in the world. At the end of 2015, households had on average more than 3.7 devices at home. The average Dutch consumer can be online 24/7. They mainly use mobile devices and increasingly consume media through visual rather than textual content. In part thanks to ever growing data speeds, online video is proving more popular than linear alternatives. At the same time, consumers are consuming content more often and for longer. Instead of content 'à la carte', consumption preferences are shifting to an 'all you can eat' buffet, with viewing behaviour that is increasingly non-stop over a longer period of time (what is known as 'binge-watching'). Consumers are no longer passive in their media consumption: they take control over their own content offer and are selective in their choices. Access to media is more important than possessing it. Consumers choose the brands with which they can identify; only those are 'admitted'. They are also willing to pay for these trusted brands. But they do expect something in return: instant access to a broad and up-to-date content 'library'1. The traditional advertising market for print, radio and TV has been under pressure for a while. To reach consumers, advertisers are shifting their budgets to online. 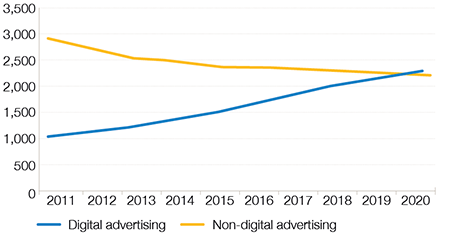 This shift is reflected in the advertising spending figures: newspapers and magazines are the only segments in the Dutch advertising market that are shrinking; online is booming. The TV advertising market is flat, while radio advertising is on the decline2. This trend will continue unabated in the coming years: in 2019, online advertising will be responsible for about half of the advertising market and as of 2020 it will become dominant and continue to grow3. The video and mobile segments in particular are growing fast. For advertisers, the main challenge is to continue to reach consumers online, as streaming services often offer advertising-free alternatives. At the same time, the explosive growth of OTT content and video offers opportunities for new forms of advertising. This means that advertising is moving into the content space: personalised and customised ads on the basis of personal preferences. Content generates the real connection with consumers: a successful campaign is no longer exclusively measured in terms of absolute reach, but also in terms of the time consumers spend watching it. Continuously improved data intelligence enables advertisers to communicate with their target groups in even more targeted ways. Competition is growing, the consumer is in control, and advertisers are shifting their budgets. Various trend reports indicate that only as of 2020 will revenues from digital media be able to offset the decline in print sales. This is a serious challenge, particularly for traditional print media companies. At the same time, these companies have unique advantages. The time consumers spend reading a printed newspaper may have gone down, but the decline seems to have stabilised over the past five years. What is more, the paper version of the newspaper arrives directly on people's doormats, a constant value in a hectic media world3. News media companies also have an important distinctive quality that is part of their DNA: they specialise in making and distributing topical content, day in day out, leveraging the media and content demands of their customers. What is more, TMG has a very strong brand portfolio that reaches and connects millions of people, which generates a wealth of data. In the Dutch media market, TMG occupies a unique position, with strong, accessible brands that reach and connect millions of people. With our distinctive media ecosystem, we create value for all our stakeholders. End 2014, TMG's new strategy was established: we put consumers at the heart of everything we do and offer 24/7 relevant content via all possible channels and devices. To this end, we are building a new, future-proof and modern media ecosystem, aimed at high-quality consumer interaction and sustainable results. With this media ecosystem, we are leveraging the opportunities offered by the changing media landscape. Complementary to the linear connection with consumers from the core of our company − the journalistic heart − the media ecosystem also offers interactive connections between brands and consumers and between consumers and advertisers. Online video and data are crucial layers in this respect. With the completion of its media ecosystem, TMG anticipates the continuing consolidation in the media market. In this environment, the winning players will be able to offer cross-media and cross-brand propositions,via all channels and modalities: print, online, social and TV/OTT/video. 24/7 content, based on editorial input, the power of the brands and online video, forms the heart of the TMG media ecosystem. Within the five main domains, news, business, sports, lifestyle and entertainment, content finds its way to consumers and advertisers via various modalities and channels. The data layer in between is enriched by two flows: both top-down and bottom-up, based on the use and the media preferences of consumers. This contributes to new revenue streams and revenue models. Modernising our IT infrastructure and making it more flexible. These results are explained in more detail elsewhere in this Annual Report. The various reorganisations that were focused on improving efficiency and creating a more agile organisation, have led to changes in TMG's organisation chart as of 1 January 2017, as shown below. For more information, see our corporate website. More information about our stakeholders, our dialogue with them and the latest materiality matrix is included as an annex to this Annual Report. The importance of media companies such as TMG is increasing in our rapidly changing information society. By excelling in our core activities; creating unique (journalistic) content, we are able to add value. Not only for consumers, but for all stakeholders in our supply chain and for society as a whole. Our value creation flow starts with the input of six different forms of ‘capital'. These represent the principal social, economic and environmental resources that we use to create value. Using the power of our company, we are in a particularly good position to play a guiding role in society and to connect. Based on this vision, by means of our media ecosystem, business operations, revenue models, strategy and the impact and reach of our brands, we add value to the six capitals (output). This output has added value for our different stakeholders (outcome). The diagram 'Value creation model' shows this value creation flow. B2B advertisements: advertisements in print and digital. In line with the development of the media ecosystem, TMG is expanding these revenue models, particularly for digital, including through e-commerce conversion, online ads (video), data propositions and digital video, offering new opportunities for advertisers, content partners and e-commerce parties. This transition of the TMG business model is the perfect moment to get a better grip on our value drivers and KPIs, and thus on the financial reporting and management information. In 2016, we therefore started a large-scale programme to arrive at a limited set of main KPIs and operational KPIs based on the business models and standardised for all brands and business units. Group Control is working on this together with the business; completion and implementation are expected in the course of 2017. Risk management is an integral part of TMG's daily business operations. TMG's internal risk management and control system is promoted by top-level management and is designed to ensure that the strategic, operational, financial and compliance risks run by the company are transparent and controlled. TMG sees a properly functioning internal risk management and control system as an essential management tool in enabling it to achieve its strategic goals. For more information about risk management activities in 2016, see Risk management. We create value for our stakeholders and achieve our ambitions and targets in a responsible way. As one of our strategic pillars, responsible business is an integral part of our business operations. In 2015, we set out our policy on responsible business under the theme ‘TMG actively engaged, every day’. In 2016, the focus was on making the policy objectives more concrete and on embedding the policy in the organisation. Our financial results are explained in more detail in the chapters on business performance (general and per business unit). The development of people, transparency, the environment and social engagement are the most important non-financial aspects of responsible business. Results and developments with regard to these aspects are explained in more detail in the chapters Our people and Responsible business.